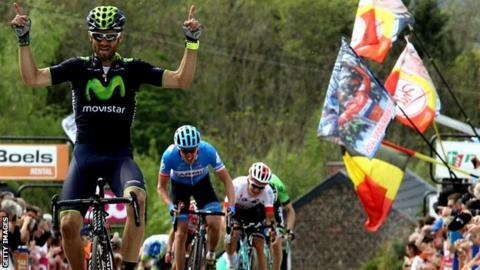 Spaniard Alejandro Valverde timed his attack to perfection on the gruelling ascent of the Mur de Huy to win his second La Fleche Wallonne race. The Movistar team leader passed Ireland's Dan Martin and Pole Michal Kwiatkowski in the final 200 metres of the 199.5km Belgian Spring Classic. Britain's Ben Swift and Josh Edmondson, plus the Isle of Man's Pete Kennaugh - all with Team Sky - did not finish. Spain's David Lopez was the highest Team Sky finisher in 126th place. "Pete was really looking to do well and was motivated for the race but he again faded a bit in the closing stages," said team director Nicolas Portal. "We know he has the talent and he will only get better from experiences like this. "Swifty was the race captain and did a really good job. He was vocal and he's an intelligent guy so we were pleased with that." 1. Alejandro Valverde (Spa/Movistar) 4:36:45"
2. Daniel Martin (Ire/Garmin) +3"
3. Michal Kwiatkowski (Pol/Omega Pharma - Quick-Step) +4"
5. Tom-Jelte Slagter (Ned/Garmin) +6"
7. Michael Albasini (Swi/Orica) +8"
9. Daniel Moreno (Spa/Katusha) +11"